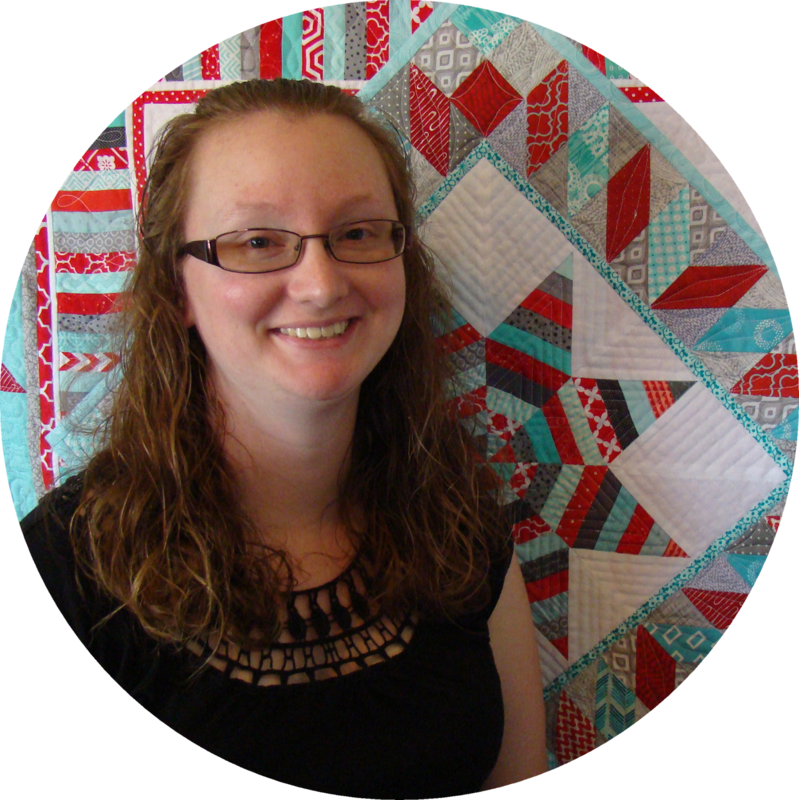 Slice of Pi Quilts: Paying It Forward - Again! I just finished up my final Pay It Forward quilt for the year! Every January, I set out to make several pay it forward gifts throughout the year. I usually post on Facebook looking for volunteers that want to receive something from me. This year, I did it slightly different than in years past. This year, I asked for my friends to nominate other people to receive a gift! One nomination was for a friend's mom that is always giving to others. When making the last Pay It Forward quilt, I decided to actually make two at once using the same pattern, just different charm packs. This one uses 25 charm squares from two packs of Hazel fabric that I bought from Connecting Threads awhile back when they were on clearance. The charm packs don't have as many squares as regular charm packs, so I mixed and matched from two sets to get a good distribution of color and prints. Hazel is a bright and cheerful fabric collection by Allison Harris of Cluck Cluck Sew for Windham Fabrics. 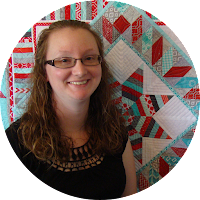 I met Allison at Quilt Market this spring and became an instant fan. She's sweet, genuine, and treated me like a true friend even though we had never met before. Just like with the twin version of this quilt, I cut 5" squares from my bolt of white Moda Bella 98. 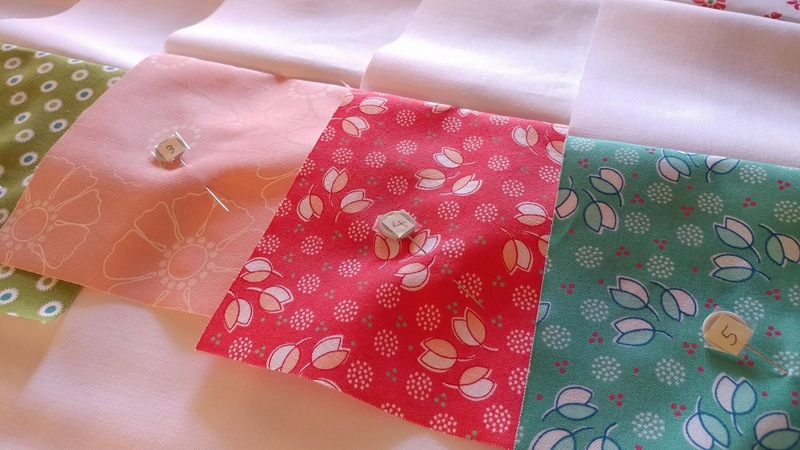 (I actually cut all the fabric for both quilts at the same time.) 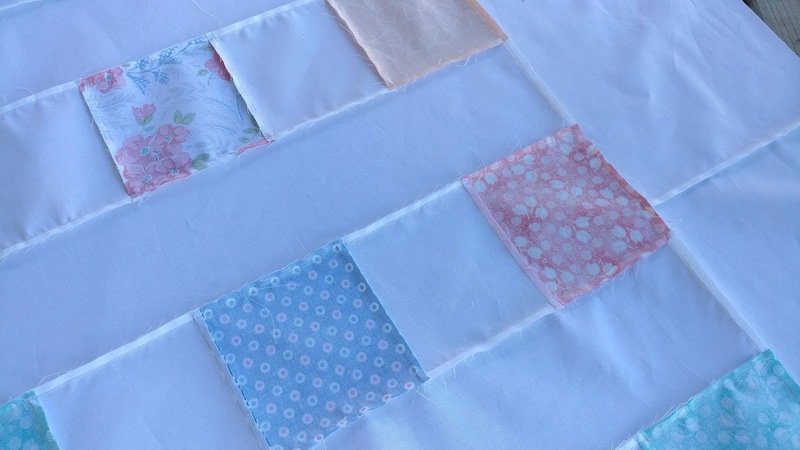 Then I sewed five print fabrics and four white squares together to form each row. I have some numbered head pins that I made from some large head pins (this set is on my Christmas list though!) that I like to stick in the first square of each row. This helps me know which row is which and which side is the left. I use them all the time! A 5" strip between each row and a 10" border made a 60" throw! 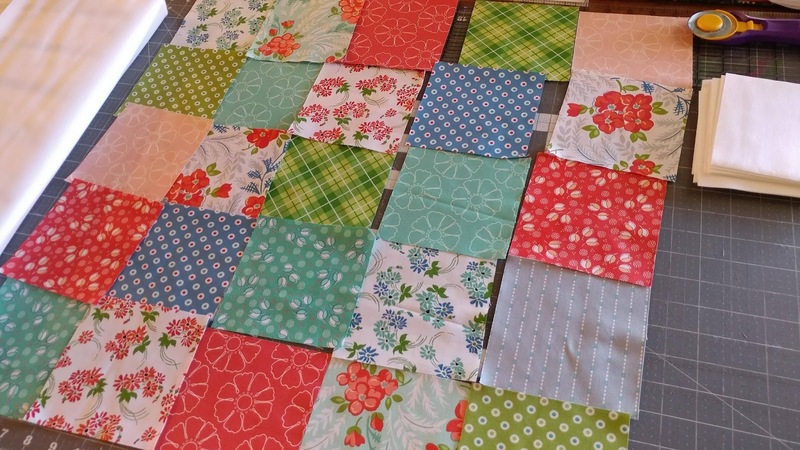 I pieced both quilts in around an hour! I had two "scrap" pieces of the 108" backing from the last quilt that were the perfect size for this one when pieced together. (The fabric is called "Widescreen" by Carolyn Friedlander for Robert Kaufman Fabrics in Desert Green (which is actually light gray). 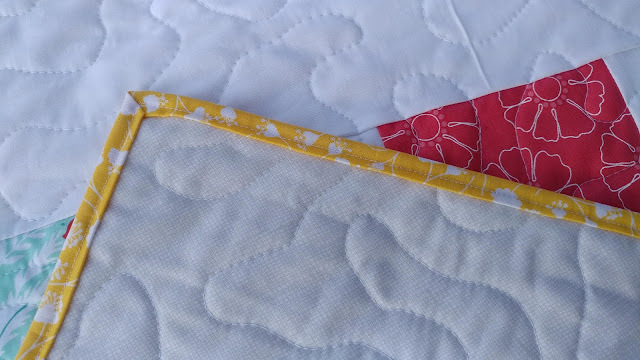 I pin basted the quilt with 80/20 batting from The Warm Co. and decided to use a medium sized stipple for quilting. 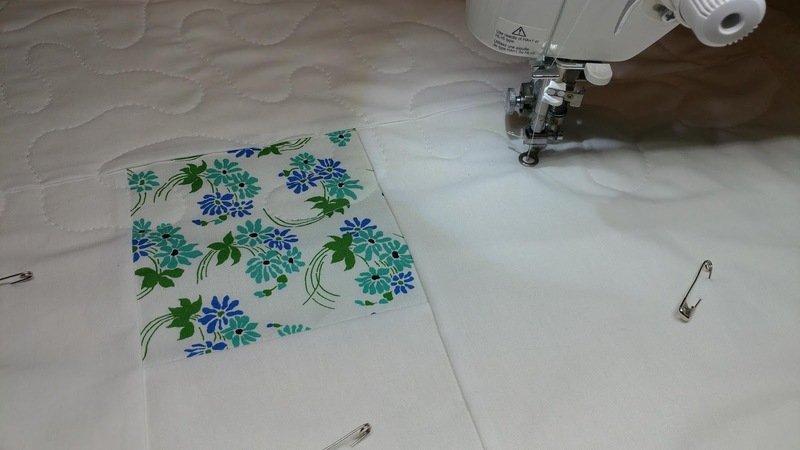 I used my Juki TL-2010Q to free motion the stipple using 50wt Aurifil thread in white #2024. Stippling and loops are my two favorite all-over quilting designs. They are fairly quick to do and don't have to be perfect to still look good! For binding, I chose a bright yellow from my stash. 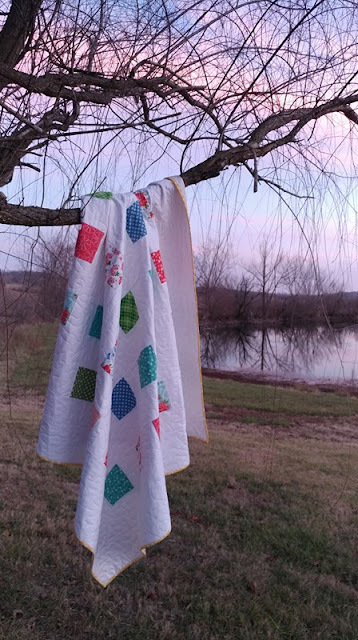 (The fabric was actually given to me by my friend whose mom is the recipient of the quilt!) It coordinates beautifully with the Hazel fabrics and provides a great pop of color around the edge. I used 2 1/4" strips and machine stitched it on. I decided not to wash the quilt before gifting it, but I did include some washing instructions in the note I put in the box. I dropped the box off at the post office just in time for the recipient to get it by Christmas. It's so fun sending such happy mail to people completely unaware it's coming! This was my 48th quilt finish for the year (see them all here) and my third Pay It Forward quilt for the year (read about the others here and here). Are you planning any Pay It Forward gifts for 2018? Linking up with Let's Bee Social at Sew Fresh Quilts, Wednesday Wait Loss at The Inquiring Quilter, Midweek Makers at Quilt Fabrication, Needle and Thread Thursday at My Quilt Infatuation, TGIFF at Powered by Quilting, Finished or Not Friday at Busy Hands Quilts, Can I Get a Whoop Whoop at Confessions of a Fabric Addict, and Finish It Up Friday at Crazy Mom Quilts. I don't do pay it forward quilts but yesterday I donated 11 youth and crib quilts, along with several receiving blankets I made to Faith Mission in Elkhart. The person I talked to said at this time they have 20 children of varying ages living there with their mothers. I hope these quilts bring some Christmas cheer to them. Your friend's mother is going to love her quilt. 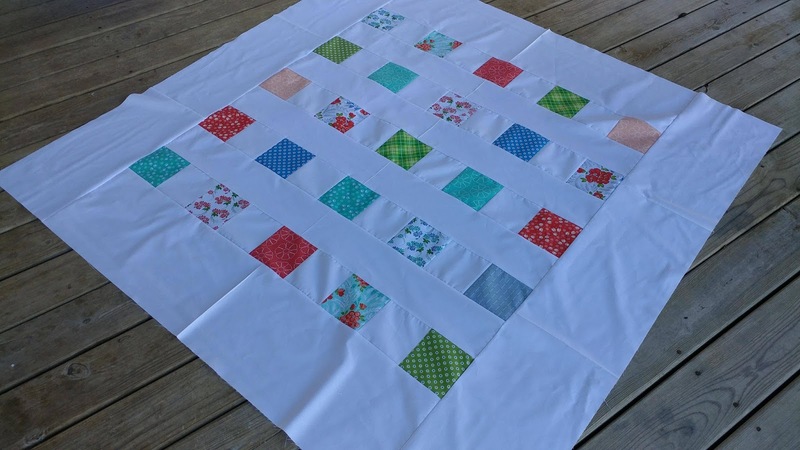 The quilt sounded to easy to piece, I'm going to try one this way too. I love simple quilts!!! Have a blessed Christmas! I am just amazed, or let's say totally impressed by your generosity! I had never heard of Pay It Forward quilts. This is inspiring. And I loved your ask friends who to gift approach. Merry Christmas! 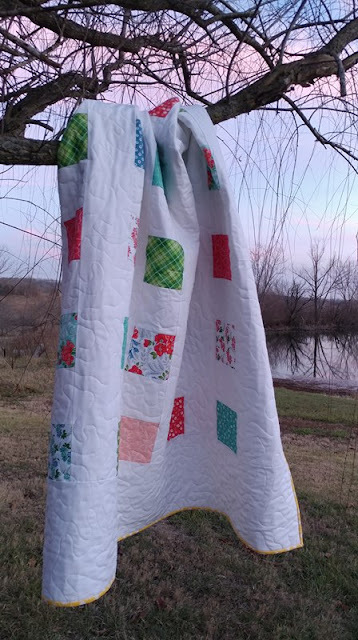 I can only imagine the joy the person has when she opens up the quilt! How very generous and kind of you to Pay it Forward! The past couple years I've sent unsuspecting people mini quilts as a secret surprise. I hope to continue doing so in 2018. Happy Holidays! What a wonderful idea! It's different from a traditional donation quilt, but just as rewarding. Maybe even more so!! SEW smart of you to make 2 quilts at once. Such as great idea! And it's done in time for Christmas. What a wonderful gift for someone who gives and gives! Thanks for linking up to Wednesday Wait Loss! I forgot to add that I wish you a wonderful Christmas. Thanks for supporting WWL. Beautiful working and a very thoughtful gift. 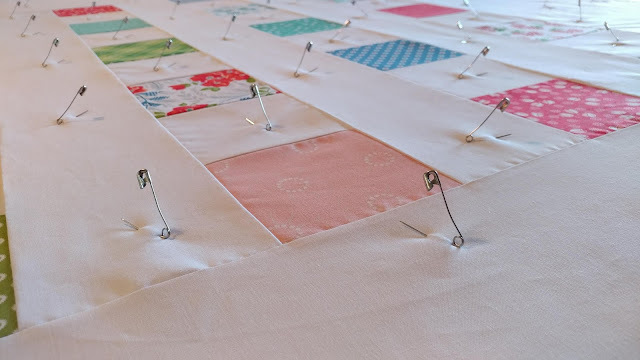 Wonderful quilts and such a lovely idea! 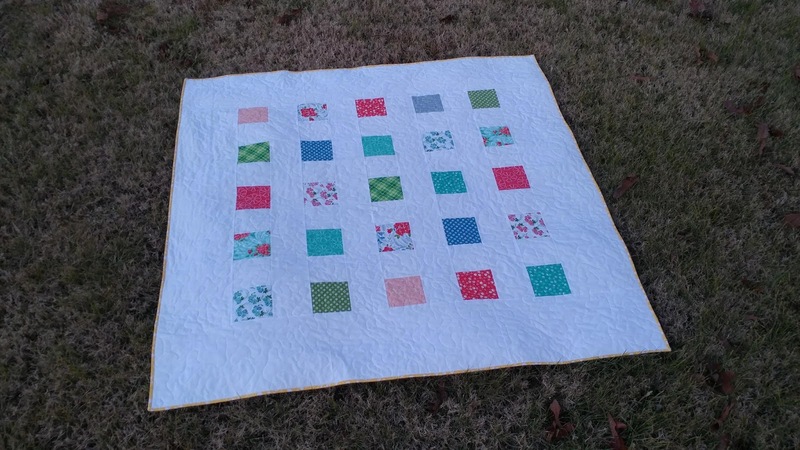 I love giving random gifts to people who aren't expecting them and making charity quilts. 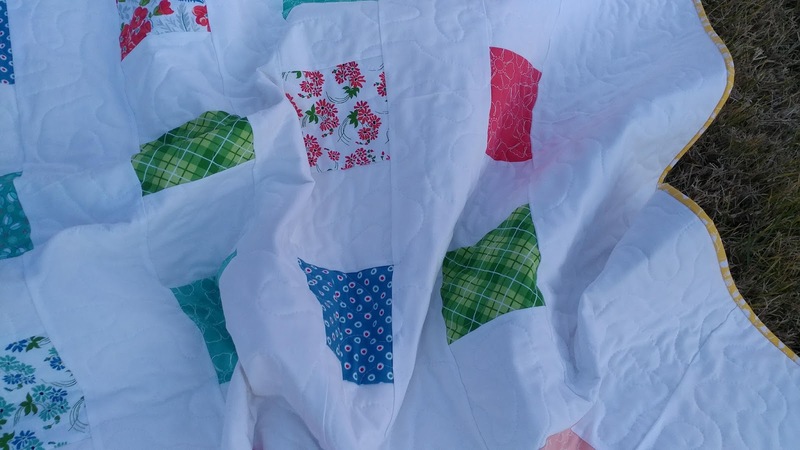 Your pay-it-forward quilts are lovely! Bless your heart. How wonderful you and your sisters turned your grief and sadness into productive and loving actions.